I am so excited about this assignment from Doodlebug. It is such a great thing to take time to stop and remember things you are grateful for. Courtney Lee from Court's Crafts here and we just moved quite a ways from "home" and are in a new neighborhood. 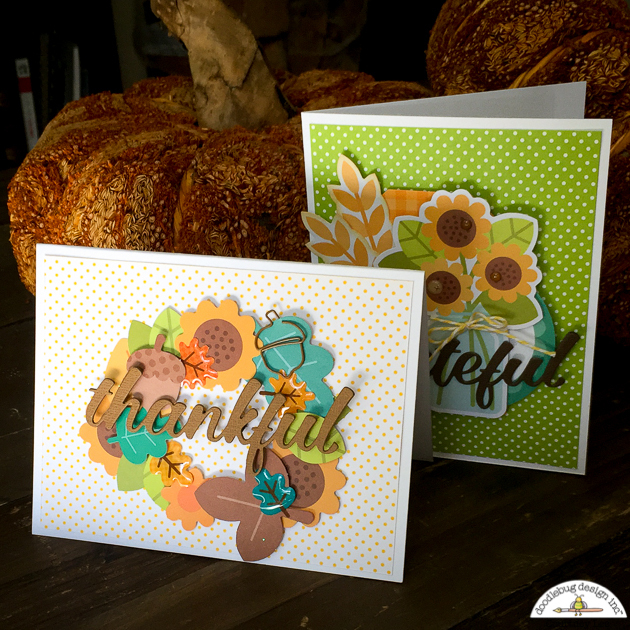 There have been a couple of people who have been just SOOO kind and I was excited to make cards to let them know how thankful we were for their kindness. 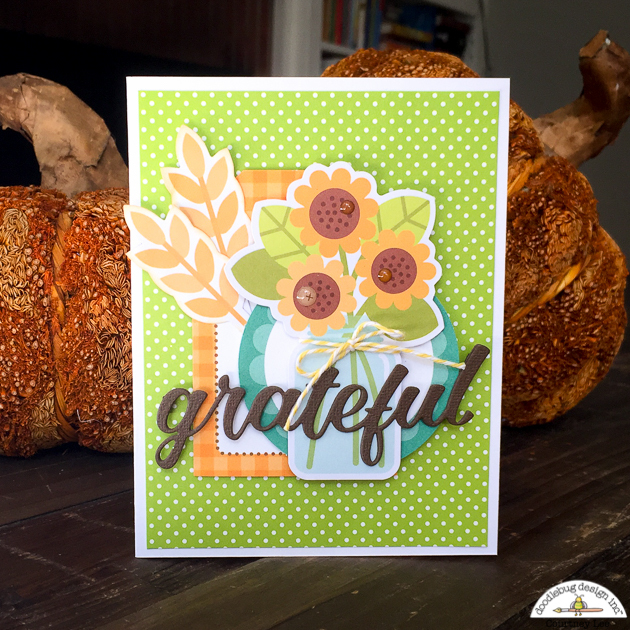 First up is my grateful card. 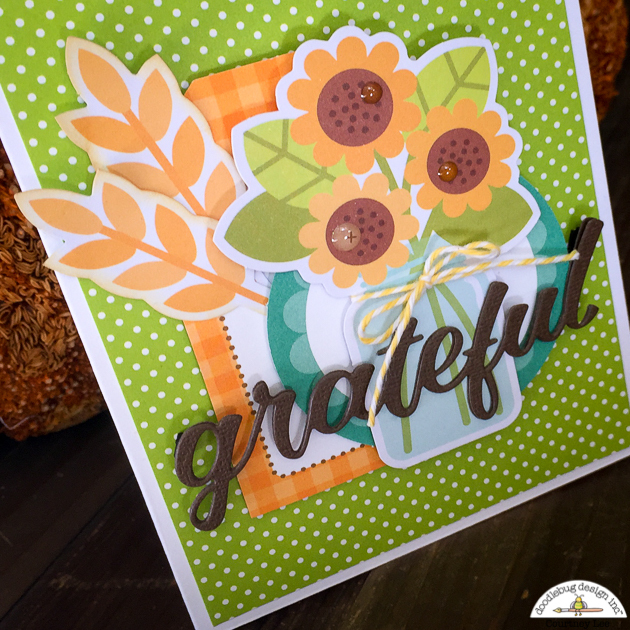 This card took on several iterations with lots and lots of pieces of things strewn around my craft desk until I decided on this design. I wanted to showcase the sunflowers in a jar and the wheat. I tied some doodle twine in bumblebee around the jar and popped out my sentiment. 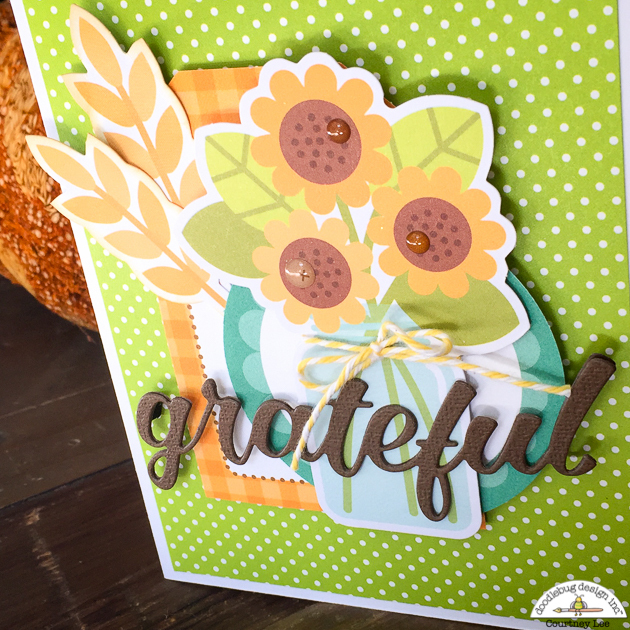 The background patterned paper is the amazing swiss dots. 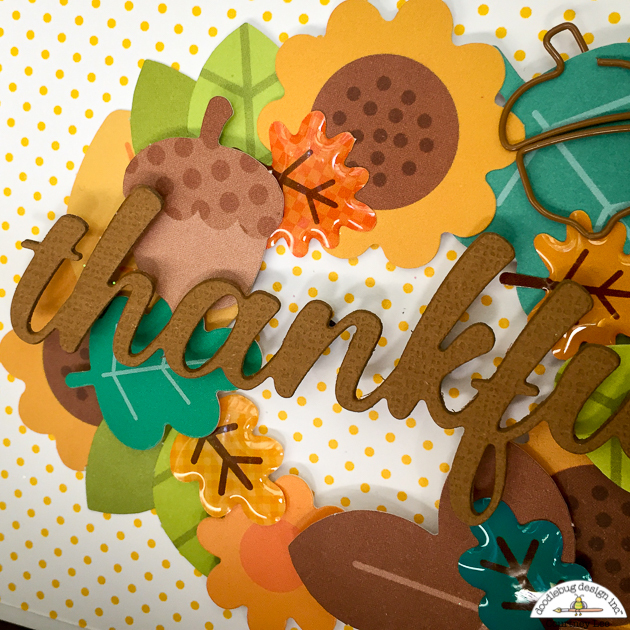 Did you know that doodlebug makes a complete swiss dots line that coordinates with all of their colors? And the backside is white with that color swiss dots (as shown in the next card) if you are looking for something a little more understated. For this next card I wanted to make a wreath out of fall things. I started with the sunflower odds and ends and worked my way up. This is the "b" side of one of the swiss dots papers. It's just the right kind of "white" with a touch of color. I added some of the icons and an older generation leaves shape sprinkles. I love how they add a pop of shine. Lastly I added the acorn cute clip from the Flea Market collection and popped my sentiment above it all. These pictures don't do the dimension on this project justice. It's really lovely as I popped some once or twice or not at all and it gave it some beautiful dimension. Here they are! 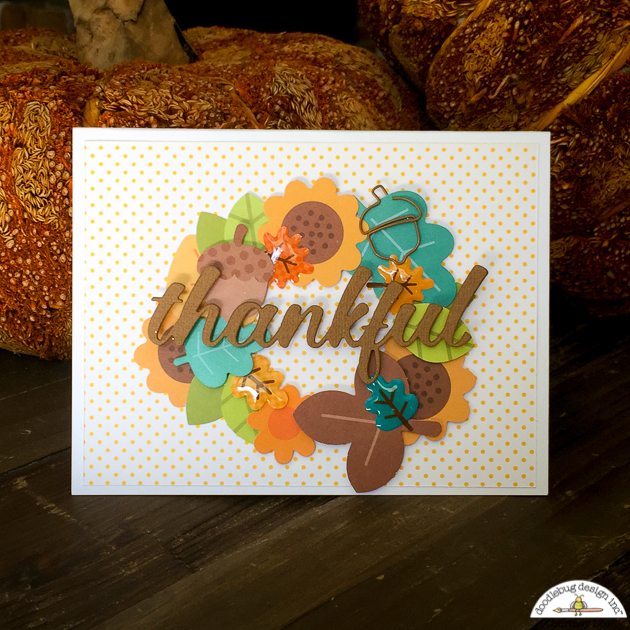 I hope this inspires you to pull out your Flea Market collection that you have hiding around and make some cards for anyone who has done something nice for you - or keep them in your purse for a waitress or waiter that went above and beyond their job! You never know when your thanks is exactly what someone needed at that time - a little appreciation. Spread joy through the season! These turned out fabulous! So pretty! Wow !, these cards are so gorgeous !